Update 07.02.2012: I’ve uploaded analysis and comments on my games. It’s that time of year again, the Kidlington Chess Congress: I’ve played here on each of the last three years too. See my old articles from 2009, 2010 and 2011. 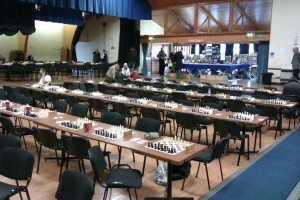 An empty playing hall just before the start of the final round. For the last two years I’ve played sufficiently well in the Under-145-graded section to obtain a grade above that level: so this year, I played in the Under-180 section. My official ECF grade is 154. Round One: played White against the second-highest rated player (grade 178) in my section. The game started slowly, but I eventually managed to find some nice moves to get a strong passed pawn in the centre of the board. I was definitely winning, but missed the crucial continuation and lost the initiative. By the end, if anything my opponent had a very slight edge although it was very unclear, but with both our time running out, he offered a Draw which I accepted. It was a solid start, a shame not to have announced my arrival in the stronger section of the tournament by beating one of the top-rated players, though! Score 0.5 out of 1. Round Two: taken as a half-point bye, as every year: score 1.0 out of 2. Round Three: the evening round is always tough. Players are tired by this time and a long game can leave you too exhausted (and too buzzed) to sleep properly afterwards. I had a underwhelming position as Black against a player with a similar grade to mine (148) which I managed to defend quite well: he missed the strongest continuation as we approached time pressure and, perhaps sensibly from his point of view, decided to take no chances and offered a Draw: I was behind on the clock and so was happy to accept that. So, score 1.5 out of 3 at the end of Day One: two draws, one game in which I missed a win, the other in which my opponent missed a win. On balance, fair enough so far. Snow arrived during the evening round of Day One and so this made for some travel complications for some competitors, which was unfortunate: not so for me, however, just living a short walk away. 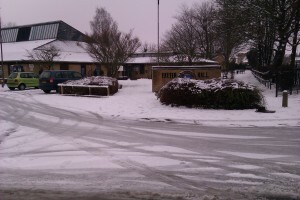 Everyone who arrived at the venue on the morning of the second day was pleased to find the heating still working! Round Five: played Black against a local player graded 146: I wasn’t very happy after the opening, because I was tied down to defending my weak central pawns. However, I found a clever resource to untangle my pieces, which had the positive effect of sending my opponent into lengthy thought (17 minutes for one apparently-simple exchange and a further 20 minutes for a second one two moves later). Luck finally turned my way when my opponent placed his Queen on the side of the board in a place where it could be trapped: he gave up a Bishop to save the Queen, but it wasn’t enough and he resigned immediately. I was very happy to finally Win: also, finishing the tournament with a win is always nice. Final score 2.5 out of 5, a very respectable 50% against strong opposition. The disappointment of losing the Round Three game was hard to take, but I’m pleased with my performance overall in the tournament. I have calculated that my grade for the tournament is 159 or 160, depending on whether they round up or down(!) And, my ongoing grade on the next grading list will also be about 160, I think, up from this year’s 154. « Should I give up on Facebook? Google+? Twitter? Hi Dave, enjoyed your account at Kidlington, it is good to hear the thoughts of a fellow chess player and well done for stepping up and taking on the “bigger boys” 50% is a solld start and hope you can make further progress. I have just returned victorious from the Frodsham congress and managed to tie = 1st in the U-150 Inter with a score of 4/5! a first round loss after having a clear advantage and then 4 wins 3 of them with the black pieces and all Sicilians 3 Najdorfs and a white against a Taimanov!